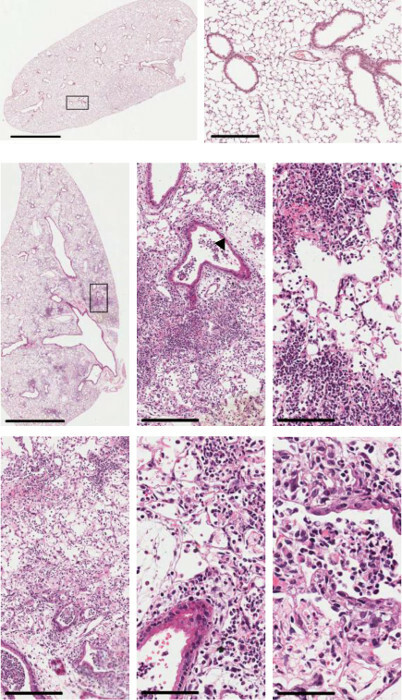 This protocol induces acute lung injury in a mouse that has close fidelity to the pathogenesis of acid pneumonitis observed in humans. We generate a maximal acute nonlethal low pH lung injury and account for differences in rodent-human anatomic respiratory structure using an open tracheostomy coupled with circumferential pressure release. Alluri, R., Kutscher, H. L., Mullan, B. A., Davidson, B. A., Knight, P. R. Open Tracheostomy Gastric Acid Aspiration Murine Model of Acute Lung Injury Results in Maximal Acute Nonlethal Lung Injury. J. Vis. Exp. (120), e54700, doi:10.3791/54700 (2017). Acid pneumonitis is a major cause of sterile acute lung injury (ALI) in humans. Acid pneumonitis spans the clinical spectrum from asymptomatic to acute respiratory distress syndrome (ARDS), characterized by neutrophilic alveolitis, and injury to both alveolar epithelium and vascular endothelium. Clinically, ARDS is defined by acute onset of hypoxemia, bilateral patchy pulmonary infiltrates and non-cardiogenic pulmonary edema. Human studies have provided us with valuable information about the physiological and inflammatory changes in the lung caused by ARDS, which has led to various hypotheses about the underling mechanisms. Unfortunately, difficulties determining the etiology of ARDS, as well as a wide range of pathophysiology have resulted in a lack of critical information that could be useful in developing therapeutic strategies. Translational animal models are valuable when their pathogenesis and pathophysiology accurately reproduce a concept proven in both in vitro and clinical settings. Although large animal models (e.g., sheep) share characteristics of the anatomy of human trachea-bronchial tree, murine models provide a host of other advantages including: low cost; short reproductive cycle lending itself to greater data acquisition; a well understood immunologic system; and a well characterized genome leading to the availability of a variety of gene deletion and transgenic strains. A robust model of low pH induced ARDS requires a murine ALI that targets mainly the alveolar epithelium, secondarily the vascular endothelium, as well as the small airways leading to the alveoli. Furthermore, a reproducible injury with wide differences between different injurious and non-injurious insults is important. The murine gastric acid aspiration model presented here using hydrochloric acid employs an open tracheostomy and recreates a pathogenic scenario that reproduces the low pH pneumonitis injury in humans. Additionally, this model can be used to examine interaction of a low pH insult with other pulmonary injurious entities (e.g., food particles, pathogenic bacteria). Gastric aspiration is an acute event defined as inhalation of materials from the stomach with or without oropharyngeal flora into the airways beyond the vocal cords. The aspirate contents may contain low pH stomach fluid, bacteria, blood, or food particles. Gastric aspiration often occurs in patients in the Intensive Care Unit (ICU), whom are typically in a fasting state and thus placed on a proton pump inhibitor to limit aspiration of acidified gastric contents. The incidence of ALI in the ICU population in the US is 2.5 - 5 times higher compared to the general patient population.3 Unfortunately, these predisposing conditions often lead to a state of bacterial overgrowth in the stomach that may lead to more severe sequelae in the lung following an aspiration event, as gastric aspiration is an independent risk factor for the development of secondary bacterial pneumonia (SBP), ALI and ARDS. To emulate an aspiration event accurately with injured alveolar epithelium, it is important to bypass an animal's natural defenses. Using a mouse aspiration model to produce an ALI that mimics the gastric acid injury seen in humans, one must account for the differences in the trachea-bronchial tree. The open tracheostomy technique that this method utilizes bypasses the differences between murine and human respiratory trees and models the injury in a manner that reproduces ALI both physiologically and histologically. Historically, intratracheal intubation was used to generate ALI, however it is considered difficult to perform in mice without laryngeal injury. Therefore, this method offers a potential alternative that has yielded consistent results across multiple researchers and with minimal procedure attributed mortality. All materials and equipment need to be gathered and adequately organized prior to procedure. The procedure is to be conducted with seamless transitions from one step to the next in order to provide consistent, reproducible data. This protocol follows institutional policies set by the Institutional Animal Care and Use Committee at the Buffalo Veterans Affairs Medical Center. NOTE: Both male and female C57BL/6 mice were used for this protocol. There is no significant difference of albumin leakage between sexes. Make 56.2 mM HClsterile by adding 281 µL of 1 N HCl to 4.72 mL sterile normal saline (SNS). Titrate to pH 1.25 with 1 N HCl (≈ 0 - 50 µL). Make this preparation fresh prior to injury. As low pH SNS is not buffered it ensures the hydrochloric acid injury insult is transient. NOTE: Ensure that the injury procedure is conducted in a fume hood with charcoal filtering for anesthetic gas scavenging. Maintenance of sterile conditions is essential as this is a survival surgery. Use sterile gloves and sterilize all instruments in a glass bead surgical instrument sterilizer prior to surgery on each animal. The use of drapes to isolate the surgical site is recommended to maintain sterility. Use isoflurane as the anesthetic gas as it provides a relatively low blood gas solubility allowing rapid induction of anesthesia, as well as rapid recovery following the injury. Start by inducing anesthesia in a chamber with 2.75% isoflurane in oxygen with flow rate of 2 L/min. Once the mouse is adequately anesthetized (unresponsive to toe pinch strong enough to not break skin or cause deep tissue damage), suspend the mouse by the superior incisors with a 15 cm length of 1-0 braided silk suture in a supine position on a 60o incline dissection board. Ensure that anesthesia is maintained throughout surgery by delivering isoflurane through a nose cone. Apply veterinary ointment on mouse's eye to prevent dryness. Shave the ventral portion of the neck with an electric trimmer and apply topical antiseptic solution (i.e., povidone-iodine). Remove excess antiseptic with gauze and let dry (~15 - 30 s). Infiltrate the midline of the neck from the sternal notch to inferior part of jaw with 100 µL 0.5% bupivacaine (to provide pre-, peri-, and post-operative analgesia). Make a 1 - 1.5 cm longitudinal midline incision in the neck with a scalpel or curved fine scissors. Penetrate the fascial membrane between the salivary glands by blunt dissection with 2 curved serrated forceps to expose the trachea (identified by the white cartilage rings). Still using the 2 serrated forceps, grasp one side of the paratracheal musculature and pull it to the side while dissecting between the muscle fibers longitudinally next to the trachea. Once dissection plane is established, continue retracting the paratracheal muscle as the second pair of forceps is worked under the trachea. Use these forceps to place a 15 cm strand of 1-0 braided silk suture into the tip of the forceps and pull through to place the suture behind the trachea. Prepare the injury instillation syringe by filling a 0.5 mL syringe attached to a 22 G needle with 0.2 mL of air followed by 3.6 mL/kg of hydrochloric acid. The air will act to aid in dispersion of the vehicle, as well as an alveolar recruitment maneuver for those alveoli that may have undergone atelectasis during anesthesia administration. NOTE: Follow local IACUC guidelines regarding post-operative analgesia and consult with your local veterinarian. Be careful about using any analgesics with anti-inflammatory properties before employing this model of sterile lung injury. To administer the injury, first discontinue isoflurane administration. Allow mouse's anesthetic depth to rise for about 10 - 15 s until it begins to react to a forceps toe pinch. Immediately begin instillation steps of injury. If anesthetic depth is too deep the animal will not breathe spontaneously after injury instillation, which is especially true for hydrochloric acid containing injuries. Have an assistant squeeze the ribcage to expel vital capacity. Use the 1-0 braided silk suture placed previously around the trachea to provide traction by pulling it superiorly and then insert syringe needle into trachea between the 1st and 2nd cartilaginous rings below the larynx. The needle bevel should face the surgeon and advance until the bevel is just past the trachea with the needle as parallel with the trachea as possible. Release the chest just before bolus administration of hydrochloric acid in order to assure dispersion and deposition into the distal airway and alveoli. Deposit the bolus in roughly 0.5 - 0.75 s. Keep the needle in the trachea until the first spontaneous breath is taken to ensure that the entire injury bolus volume is inhaled into the lungs. Close incision using either 1 - 2 skin staples or sutures. Using a 5 mL syringe with a 26 G needle, inject 1 mL SNS subcutaneously into scruff of neck for fluid resuscitation. Although there is minimal fluid loss during procedure, following surgery the mouse tends to not drink and can potentially dehydrate. Alternatively, provide SNS via an intraperitoneal injection. Place mouse in heated chamber at 37 °C perfused with 100% O2. Ensure that the mouse is adequately recovered before being placed back into housing. Monitor animals and do not leave unattended during this time until ambulatory and fully recovered. Induce and maintain isoflurane anesthesia as described in Step 2.1 and Step 2.2. Confirm adequate plane of anesthesia using toe pinch method described in Step 2.2. Secure in a supine position on a dissecting board and use a loop of 1-0 braided silk suture hooked onto the superior incisors to extend the neck. Apply veterinary ointment on eyes to prevent dryness. After removing the neck skin staples, make a midline longitudinal incision through the skin from the lower abdominal wall through the previous neck incision to the mandible with scissors. Make a midline incision in the peritoneal musculature with scissors and retract the abdominal organs with sponges to expose the retroperitoneal space. If blood is needed, collect from the abdominal aorta or inferior vena cava at this point. Euthanize the animal via exsanguination by transecting the abdominal aorta and inferior vena cava. By utilizing a bilateral thoracotomy in the following step a secondary confirmatory method of euthanasia will be completed humanely as established by IACUC guidelines. Perforate the diaphragm to cause lung collapse. Then using bone cutting scissors, cut away the diaphragm and cut through the rib cage parallel to and on both sides of the sternum. Use a locking hemostat to retract the sternal flap to facilitate injecting 5 mL warm (37 °C) Hank's Balanced Salt Solution with calcium and magnesium into the right ventricle to flush the lung vasculature. As the blood from the aorta is obtained to evaluate peripheral cytokine levels prior to the procedure described in this paper, make a small incision in the left ventricle to provide necessary outflow for blood to leave the circulation to adequate flush the lung vasculature if not obtaining blood. Prop the dissection board to a 60° incline and use the procedure described in Step 2.2 to facilitate inserting a 20 G x ½" stainless steel cannula in the trachea and secure with a 1-0 suture. Place the dissection board horizontally and perform a bronchoalveolar lavage (BAL). To perform the BAL attach two 5 mL syringes to a 3-way stopcock. Fill one syringe with 5 mL of SNS and screw into port of stopcock. Attach an empty 5 mL syringe to a 2nd port and finally attach open port of stopcock to intra-tracheal cannula placed in Step 5.6. Instill 1 mL of NS into lungs and lavage with second syringe. Repeat for 5 total 1 mL NS instillations being careful that the tracheal cannula remains secured and parallel to the trachea so it does not tear the trachea. For histological analysis, cannulate the trachea as in Step 5.7. Fix the lungs by insufflating with 10% neutral buffered formalin at 20 cm H2O for 24 h.
Process the recovered BAL by centrifuging at 1,500 x g for 3 min at 4 °C. Aliquot the cell-free BAL supernatants in equivalent amounts into 2.0 mL microcentrifuge tubes for future analysis. Store at -80 °C. Analyze the BAL for albumin concentration by ELISA, or any other biological product of interest.11The pelleted cells from the BAL can be counted, cytoslide specimens generated, and stained with Wright-Giemsa-based stain for white blood cell differential count determination to assess the lungs' inflammatory reaction. Mice were injured as described above and lungs were removed 24 h post low pH insult, sectioned and H&E stained (Figure 1). Necrotic cells, loss of lung parenchymal architecture, cells and debris within airspaces and significant PMN infiltration are clearly observed. Similar to aspiration clinically, our model results in a heterogeneous injury of the distal lung air spaces resulting in areas of patchy PMN infiltration and fibrinous protein deposition. This is very similar to the pattern observed in human ARDS patients histologically. A hallmark of acid aspiration is leakage of serum proteins into the airways. The severity of this pathogenic response to a low pH alveolar insult was determined by measuring BAL albumin concentrations. Albumin concentration in the BAL was increased following acid aspiration compared to normal saline (NS) controls at 2 h and 5 h (Figure 2). This is consistent with the pathophysiology observed in patients following acid aspiration. 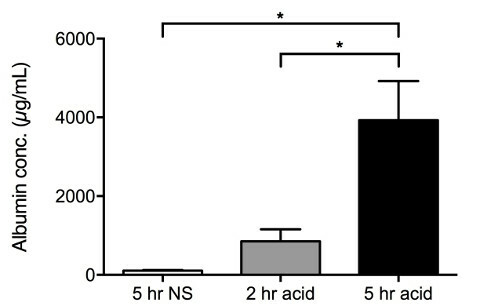 Time points were chosen as neutrophil infiltration occurs 2 h post acid aspiration and maximal non-lethal lung injury occurs at 5 h post acid aspiration. Figure 1: Pulmonary Histopathology of CD-1 mice 24 h following Hydrochloric Acid Aspiration. H&E-stained, 5 µm sections from an uninjured mouse (A and B) and a mouse injured with hydrochloric acid (C-H). Necrotic cells (arrowhead), loss of parenchymal architecture, cells and debris within airspaces (arrows) and significant neutrophil infiltration (*) are seen throughout the lungs from the injured mice. A heterogeneous distribution the distal lung is observed with areas of patchy neutrophil infiltration and fibrinous protein deposition. This is very similar to the histopathology of ARDS in patients. Scale bars = A and C = 2 mm; B, D, F = 200 µm; E = 100 µm; and G and H = 60 µm. Boxes in A and C indicate areas that are magnified in images B and D, respectively. Please click here to view a larger version of this figure. Figure 2: Albumin Leakage into Airways following Acid Aspiration. Albumin concentration of cell-free BAL fluid from C57BL/6 mice at 2 h and 5 h post acid aspiration. Acid aspiration was compared to 5 h NS aspiration control (n = 9) using an unpaired t test. Error bars indicate SEM. * = p <0.05. Please click here to view a larger version of this figure. The objective was to develop an ALI animal model using gastric acid aspiration that closely resembles the pathophysiology that occurs in humans during development of acid pneumonitis and subsequent ARDS. In developing a model, we chose an animal species that offers high throughput data acquisition due to its low cost, short reproductive cycle, and a well understood immunological system with an abundance of investigative tools (i.e., monoclonal antibodies, transgenic strains). There are several advantages to utilizing the open tracheostomy method for hydrochloric acid aspiration instillation versus direct hydrochloric acid aspiration application into the oropharynx. Non-invasive instillation through the oropharynx is the easiest and least invasive method for delivery of hydrochloric acid aspiration to the lungs of small animals. However, due to the very low pH required of the aspirate to produce maximal nonlethal lung injury, any reflux following instillation will lead to post procedure obstructive conditions e.g., laryngeal edema, laryngospasm, sloughing of upper airway epithelium. In using the open tracheostomy method, hydrochloric acid is consistently able to reach the targeted area (e.g., distal airways and alveolar sacs) thus replicating the ALI mechanism. One can enhance ALI by combining hydrochloric acid aspiration with an alveoli recruitment maneuver using a bolus air "chaser" during hydrochloric acid administration. This maneuver opens up atelectatic alveoli following initiation of volatile anesthesia. Atelectasis is a well-known sequelae of volatile anesthetic inhalation caused by decreased smooth muscle tone which impedes the function of surfactant and causes the animal to have lower tidal volumes leading to V/Q mismatch. The air "chaser" equates to an alveolar recruitment maneuver regularly used in the operating room on patients following a surgical procedure. The recruitment maneuver provides a larger area for directed injury and aids in dispersion of the hydrochloric acid to the distal airway and alveoli. One can evaluate a successful intratracheal instillation by evaluating respiratory rate following return of spontaneous breathing as this is known to increase following delivery of the hydrochloric acid. We use 5 mL NS total to lavage the lungs in 1 mL increments. Although the normal TLC of a mouse is 1 mL the large volume used ensures recovery of the maximal amount of albumin in order to quantify the injury. It is important to take into account that this will dilute the proteins and more so the pro-inflammatory mediators as they are usually in the order of pg/mL under normal circumstances. The variability can be mitigated by consistent processing of the BAL fluid. When utilizing this method, control animals utilizing a sham surgery should be performed in order to make appropriate comparisons as the tracheostomy itself produces inflammation. An alternative approach to providing adequate anesthesia to mice would be via intraperitoneal injection of ketamine and xylazine compared to isoflurane inhalation as this paper describes. This option is best left to the researcher based on their comfort level in performing this alternative method. Advantages included minimized interactions with immune response as volatile anesthetics are known to alter normal immune system physiology. There have been many advances in intubation methods used in mice, which require further investigation to reliably reproduce the histopathology of human ALI. The concerns that exist with intubation techniques include: proper endotracheal tube placement beyond the cords and above the carina; laryngospasm and bronchospasm; and laryngeal trauma caused by the technique itself. These are eliminated using the open tracheostomy method that this method employs. This method is not without limitations however as the tracheotomy itself produces injury and acid instillation performed with an injection needle may further increase the risk of severe injury. Mice awake from this procedure with pain, which subsequently worsens their perioperative hypovolemia secondary to lack of drinking. As such, this method provides an alternative to intubation techniques, which can decrease the amount of injury if performed correctly. Ravi Alluri and Hilliard L. Kutscher are supported by Ruth L. Kirschstein National Research Service Award (NRSA) Institutional Research Training Grant 1T32GM099607. Knight, P. R., Rutter, T., Tait, A. R., Coleman, E., Johnson, K. Pathogenesis of gastric particulate lung injury: a comparison and interaction with acidic pneumonitis. Anesth Analg. 77, (4), 754-760 (1993). Raghavendran, K., Nemzek, J., Napolitano, L. M., Knight, P. R. Aspiration-induced lung injury. Crit Care Med. 39, (4), 818-826 (2011). Rubenfeld, G. D., et al. Incidence and outcomes of acute lung injury. N Engl J Med. 353, (16), 1685-1693 (2005). Kennedy, T. P., et al. Acute acid aspiration lung injury in the rat: biphasic pathogenesis. Anesthesia & Analgesia. 69, (1), 87-92 (1989). Kudoh, I., et al. The effect of pentoxifylline on acid-induced alveolar epithelial injury. Anesthesiology. 82, (2), 531-541 (1995). Prophet, E. B., Mills, B., Arrington, J. B., Sobin, L. H. Laboratory methods in histotechnology. American Registry of Pathology. (1995). Kyriakides, C., et al. Membrane attack complex of complement and neutrophils mediate the injury of acid aspiration. J Appl Physiol. 87, (6), 2357-2361 (1999). Yoshikawa, S., et al. Acute ventilator-induced vascular permeability and cytokine responses in isolated and in situ mouse lungs. J Appl Physiol. 97, (6), 2190-2199 (2004). Eyal, F. G., Hamm, C. R., Coker-Flowers, P., Stober, M., Parker, J. C. The neutralization of alveolar macrophages reduces barotrauma-induced lung injury. FASEB J. 16, (4), 410-411 (2002). Hermans, C., Bernard, A. Lung epithelium-specific proteins: characteristics and potential applications as markers. Am J Respir Crit Care Med. 159, (2), 646-678 (1999). Segal, B. H., et al. Acid aspiration-induced lung inflammation and injury are exacerbated in NADPH oxidase-deficient mice. Am J Physiol Lung Cell Mol Physiol. 292, (3), 760-768 (2007). Matthay, M. A., Robriquet, L., Fang, X. Alveolar epithelium: role in lung fluid balance and acute lung injury. Proc Am Thorac Soc. 2, (3), 206-213 (2005). Richard, J. C., Factor, P., Welch, L. C., Schuster, D. P. Imaging the spatial distribution of transgene expression in the lungs with positron emission tomography. Gene Ther. 10, (25), 2074-2080 (2003).